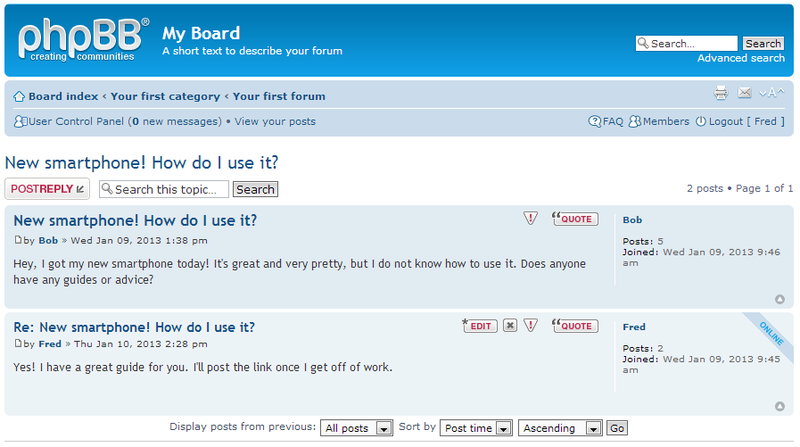 After learning to create a new topic in your phpBB 3.0 site, you will want to know how to reply to a topic. It is fairly simple and much like creating a new topic, but it is important to understand this task specifically so you can help your new members who may have questions. Log into your phpBB website. Users will sign in as themselves, Administrators can choose to sign in either the Admin user or their own user account. For this example, we will demonstrate with a user named Bob. After signing in, you will see the main page with the main page with a list of forums divided into categories. Click on the name of the forum you want to work in. Our user Bob will click on the forum named Your First Forum. You are led to a screen that lists all the topics under that forum. Scroll through the list and find the topic to which you wish to reply. Click on the topic name to go to the next screen. For our example, Bob wants to reply to the 'New Smartphone' topic, so he clicks on the topic title. Now we are on the topic screen where you can see the original topic. Both above and below the topic there is a button entitled Post Reply. Click on either button to continue to the message creation page. You are taken to the message creation screen. Your Subject will be prefilled with the original topic title with 'Re:' added to the front. You can certainly delete it and create your own. Next is the message body section where you can enter your reply. Once finished, click on the Submit button to place your new reply into the conversation. Now that you have added your reply, you can return to the topic and see your reply.